It’s only heroic if someone is good enough to pull it off. 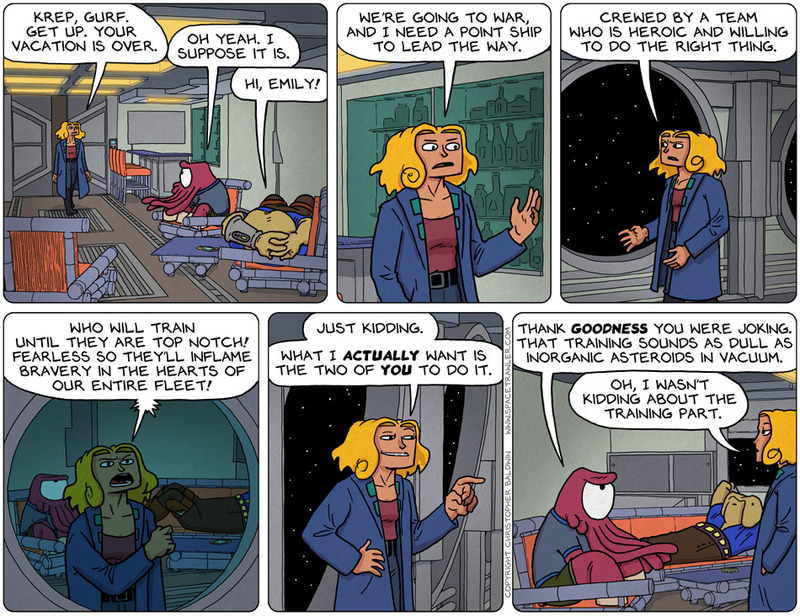 I’m not so sure that inorganic asteroids would necessarily be boring, there may be mineral wealth there. Beings need gold to make the electronics work. Perhaps he meant blunt rather than boring. Certainly she wants them to *hone* their skills. The rock troll Olympic teams frequently get caught ‘stoning’ on them. You’re advised to never volunteer in the military. You’ll be ordered to go anyway, but you can say it wasn’t your idea. Did I miss Krep giving up swearing or something? I didn’t think “thank goodness” was a phrase in his vocabulary. Your aim will improve with practice. And, I think we’ve pretty well established that Krep can’t grow tentacles back. So… what is Krep’s skill-set, exactly? I know Gurf is one hell of a gunner/fighter pilot…. Skill set? OH, bitching, moaning, nagging, pointing out obvious faults ..
IOW, the hallmarks of a true leader. Emily’s got one hell of a motivational routine, doesn’t she? Load on the guts and glory she KNOWS neither Krep nor (well, maybe) Gurf will respond to, then make it clear they’re going to work their tails off to get good and ready to kill and get killed, like it or don’t. Not even as effective as the late R. Lee Ermey, and no where near as funny.